November 1. 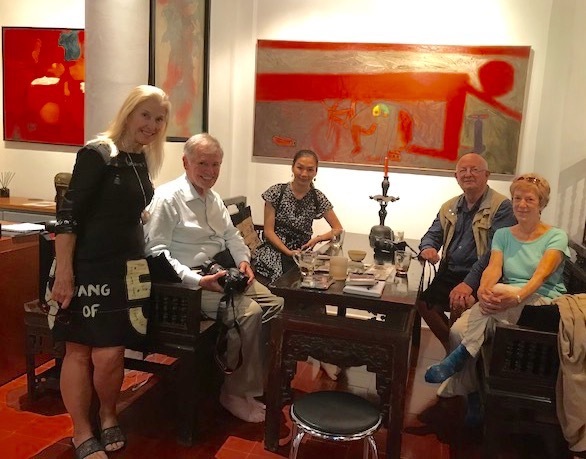 Chet, Carol and I have breakfast in the hotel, then set off to the gallery w had visited yesterday and talk with the artist, Thiet Cuong. 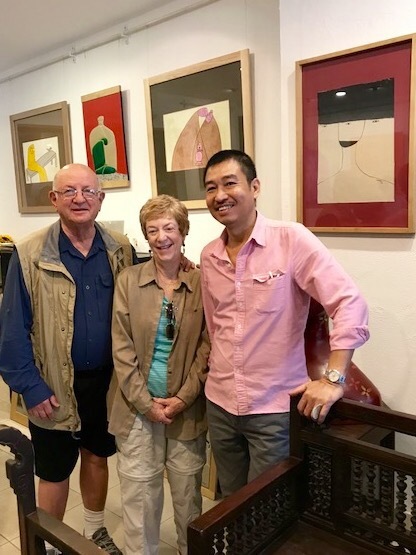 We purchase the black and white painting pictured below (over Cuong’s left shoulder), as well as some ceramic plates. 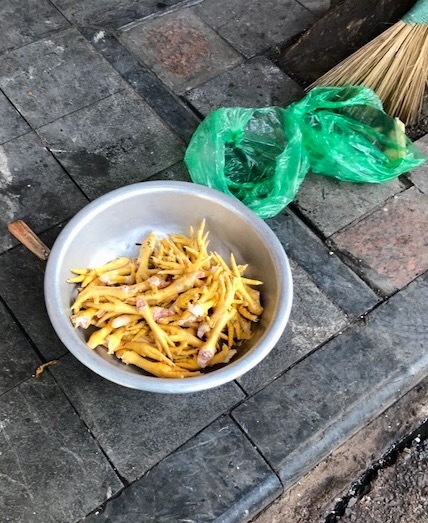 Outside we see some street food, chicken feet. 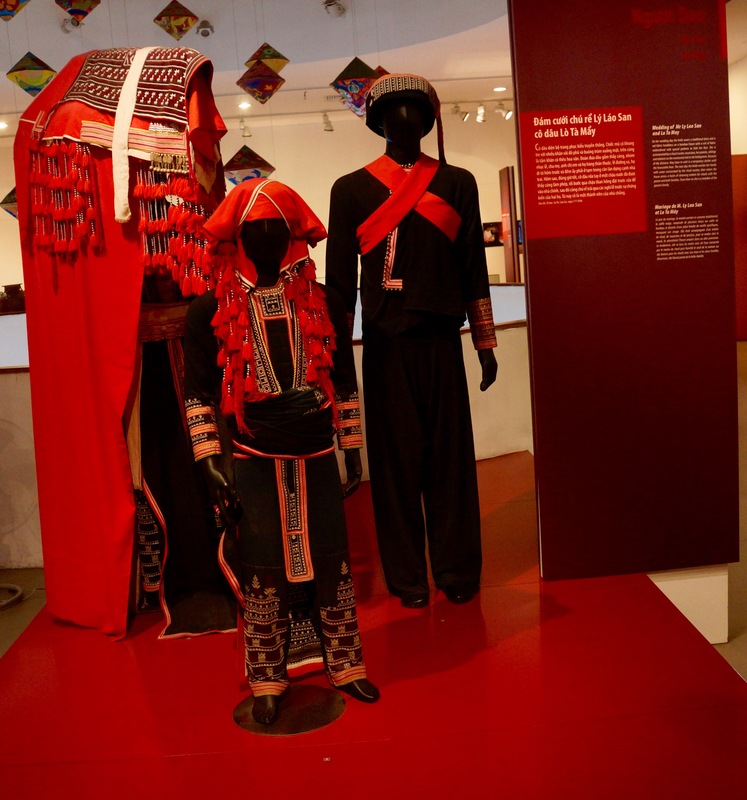 We proceed to the women’s museum, which has interesting exhibits on the rituals and costumes used in marriage and other family events in different parts of Vietnam. We then drive to the home and gallery of Susanne Lecht, an American born in Montana. We hear the fascinating story of her migration from Montana to Kansas to New York to Japan to Vietnam, where she currently is a force in the contemporary Vietnamese art scene. 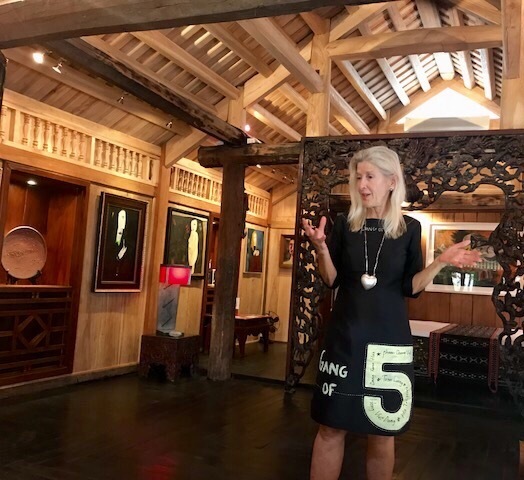 Suzanne spends an hour and a half talking with us about her background, the building of her house and the artists and art wok on display in her home. 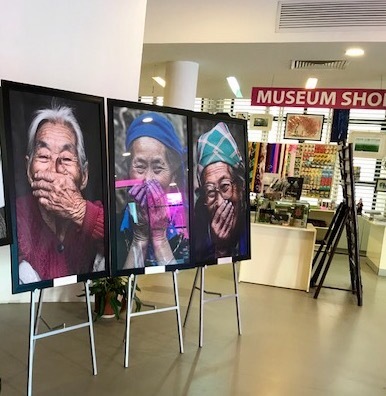 She represents a group of Artists called The Gang of Five, who are very popular in Vietnam. This is a most delightful visit. From Suzanne’s gallery, we taxi back to the hotel for lunch. Happily, Nancy joins us for the first time in several days. We pack and lounge around awaiting our late check out and transfer to the airport. My back has been hurting, so Carol is doing what she can to help with massages, and the hotel has called the airline to arrange for a wheel chair to help me get to and from the gate. So sorry about your back pain! Safe travels? 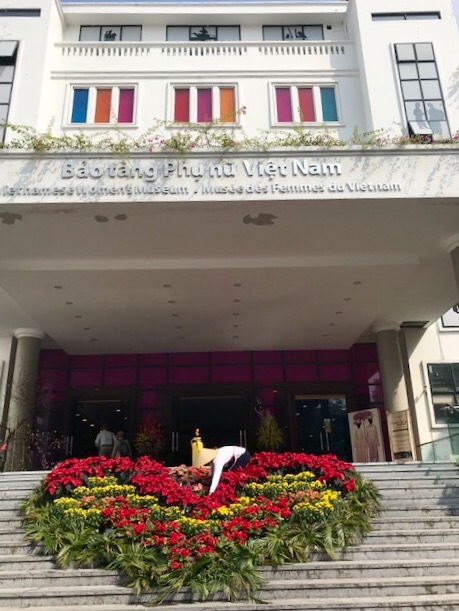 I am really impressed that so many Americans live and work in Vietnam. Your experiences and photos highlight how varied and rich are the lives of the people within a monolithic political system. Your ability to soldier on with good humor with your back problem is equally impressive. Thank you Arnie for your very interesting posts! I hope your back pain is on the mend!! Thanks, Henri. Back is better last two days. Hope all’s well in AZ.